Russia is talking to Cuba, Vietnam and the Indian Ocean island country of Seychelles about housing Russian naval ships, the Navy chief said in remarks reported Friday, the eve of the country's Navy Day celebrations. Vice Admiral Viktor Chirkov told RIA-Novosti that Russia is in talks about setting up maintenance and supply facilities for Russian ships in those countries but wouldn't give any further details. Russia's only existing naval base outside the former Soviet Union is located in the Syrian port of Tartus. A squadron of Navy ships, including several assault ships carrying marines, is currently heading to Tartus in a show of support for a longtime ally whom Moscow protected from international sanctions and continued to supply with weapons. Chirkov's statement marked a sharp about-face for Russia, which closed a Soviet-era naval base at Vietnam's Cam Ranh Bay and a spy base in Lourdes, Cuba, during President Vladimir Putin's first term in the early 2000s. Foreign Minister Sergei Lavrov denied that Chirkov's comments meant that Russia was planning to open more naval bases abroad, Interfax reported. He said a site in Vietnam would give Russian sailors a place to rest and provide maintenance to ships. Meanwhile, current and former sailors on Sunday celebrated Navy Day, a tradition established in 1939. Festivities were held in many cities and at all ports used by the Navy, including Ukraine's Sevastopol, home to the Black Sea Fleet. 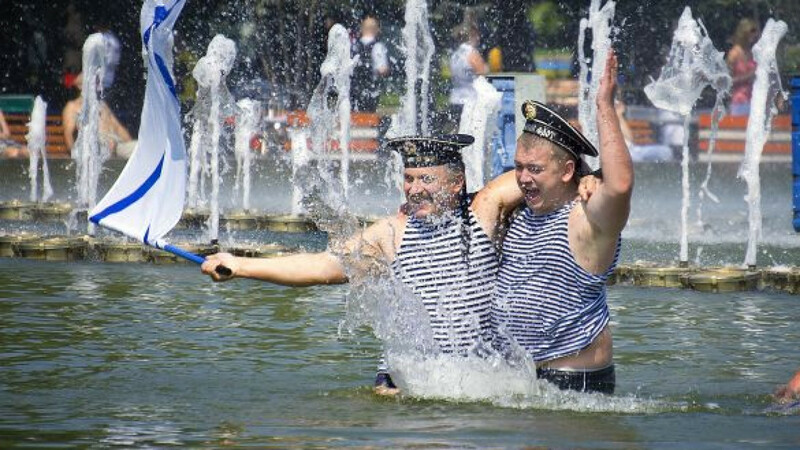 For the first time since the Soviet collapse, Russian and Ukrainian fleets held joint Navy Day celebrations there.